He was appointed pastor of St. Alphonsus in Baltimore, 1854; pastor and prefect of students at Sts. Peter and Paul in Cumberland, MD, 1857; and pastor and prefect of students at St. Mary’s in Annapolis, Md., 1862. Replaced as prefect of students, he preached missions in German and English throughout the Northeast and Midwest. Father Seelos was always an active and highly successful missioner. He was particularly devoted to the confessional, and was revered as an exceptional confessor and spiritual director. After a year as assistant pastor of St. Mary’s in Detroit in 1866, he was assigned as pastor of Assumption Parish in New Orleans. There he made a great effort to care for the poor, sick, and neglected. While caring for victims of yellow fever, he contracted the disease himself. Only a year after being assigned, he died in New Orleans on October 4, 1867. He was beatified in 2000. O Lord, my strength and my Redeemer, let the words of my mouth and the meditation of my heart be pleasing in Your sight. 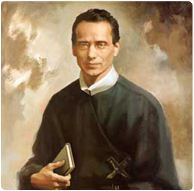 I offer praise to You for the grace You bestowed on Your humble missionary, Blessed Francis Xavier Seelos. May I have the same joyful vigor that Father Seelos possessed during his earthly life to love You deeply and live faithfully Your gospel. Divine Physician, You infused Blessed Francis Xavier Seelos with the gift of Your healing. By the help of his prayers, sustain in me the grace to know Your will and the strength to overcome my afflictions. For love of You, make me whole. May I learn from the example of Blessed Seelos and gain comfort from his patient endurance. Bountiful God, in Blessed Francis Xavier Seelos You have given Your people a model for those who labor joyfully in Your earthly kingdom. May the smile of Father Seelos in Your heavenly dominion dwell on those who find life burdensome. Help Father Seelos to keep continually before the eyes of Your people the gentleness of Jesus Christ, our Redeemer. Amen.